As a former Gartner analyst who was the lead author on the corporate telephony (CT) magic quadrant, below are a few observations from this year's UC MQ (recently published but not publicly available yet). Only Eight Vendors -- These are the same eight vendors that were on the 2015 CT MQ, which Gartner retired in October of that year, even though it was still one of the top reports and even drew more downloads than the UC MQ. With Mitel's acquisition of ShoreTel last year, the list of qualified vendors shrank, in turn impacting the positioning of the remaining vendors, based on how the MQ tool works. A vendor's UC solution could have improved over the past year, but with a niche player gone (ShoreTel), everyone's baseline goes down. Positioning -- The positioning between the CT and UC MQs are different. The UC MQ focuses more on the experience of the standard end user, whereas the CT MQ put more weight on the power users experience (power user = contact center agent, executive administrator, operator, front desk employee). As Gartner retired the Web conferencing and group video MQs, the weighting of these services in the UC MQ went up. Hybrid -- The UC MQ focuses on-premises implementation, but it does take a vendor's cloud capabilities into consideration for hybrid implementations. The same eight vendors in the 2018 Gartner magic quadrant for UC (not yet publicly available) are the same as in the 2015 MQ for corporate telephony (shown here). 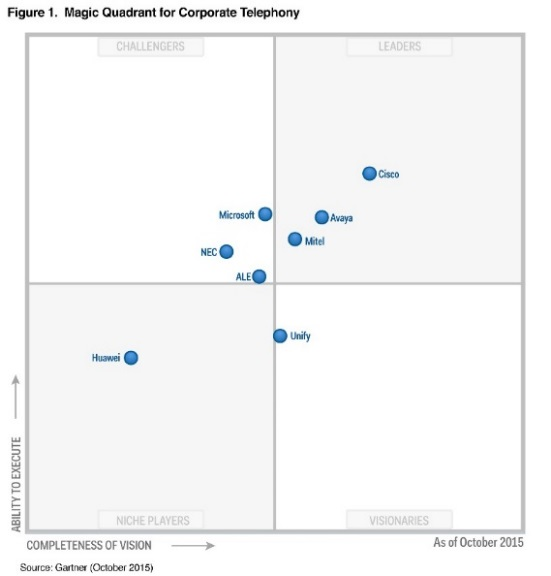 Cisco -- Cisco remains a leader across the board. It has done a good job of adopting and integrating new technologies, such as WebRTC, with its legacy platforms and ensuring a quality solution, in part through delivering a robust underlying IP network. Microsoft -- Microsoft treats voice as just another application. It doesn't respect that professional-grade voice service requires 99.999% reliability, a mean opinion score above 4.5, and features specifically for power users. Microsoft's adoption of freemium offerings and its strong cloud play will serve it well in the general market. Avaya -- Avaya, as well as its partners and customers, continue to lag the market in adopting new technology and business models. Avaya was slow to adopt virtualization, cloud, and a single UC client. NEC -- It's hard to see NEC move to a niche player this year since it arguably sells more phones than anyone else; has a full feature set; is doing some leading edge things, including incorporating facial recognition into communications; and gets decent reviews. In 2015, Gartner had seven MQs for UC -- Corporate Telephony, UC, UC for Mid- Market, Group Video, Web Conferencing, Contact Center Infrastructure, and UCaaS. It has since dropped four (CT, UC mid-market, Group Video, and Web Conferencing) and added two (CCaaS for both North America and Western Europe). Gartner is slow to add MQs for new markets. I would like to see an MQ for CPaaS, for instance. Beyond the MQs, Gartner lets clients rank their experiences with vendors via its Peer Insights tool. You'd think the UC MQ results would be in line with the Peer Insights rankings, but this isn't always the case. This site is publicly available (for now) and you can go in and compare vendors and read the reviews. In my opinion, this information is more valuable than the MQ or critical capabilities reports, since it's coming from people who actually install and use these solutions. Just as the corporate telephony MQ before it, the UC MQ is coming to the end of its usefulness. The idea that an enterprise will use a single platform for all communications is dead. Business communications is increasing an embedded capability in applications, and no one vendor does all things well across all regions of the world.